The circlet of crabs carved in low relief on the frame of this painting is integral to its success as a work of art. Echoing the seaside theme, and offering closure to an otherwise excessively open composition, the frame participates in the painting quite as constructively as the bending figure and wave-lapped beach. The cool monochrome of the location suggests an English coastal resort, though clearly Margetson had the Mediterranean in mind. His lovely fossicker is dressed to evoke the ancient classical past more than late Victorian England. Indeed, Margetson's rather dry application of pale pigment echoes Roman fresco technique. Like most of the lesser genre painters and portraitists of his day, he succumbed to the ever-virulent strain of Victorian classicism, being influenced by better-known contemporaries such as Leighton and Poynter. It goes without saying that the pearl of the title is a punning allusion to the maiden herself. Signed and dated l.l., oil "W H Margetson 1897". 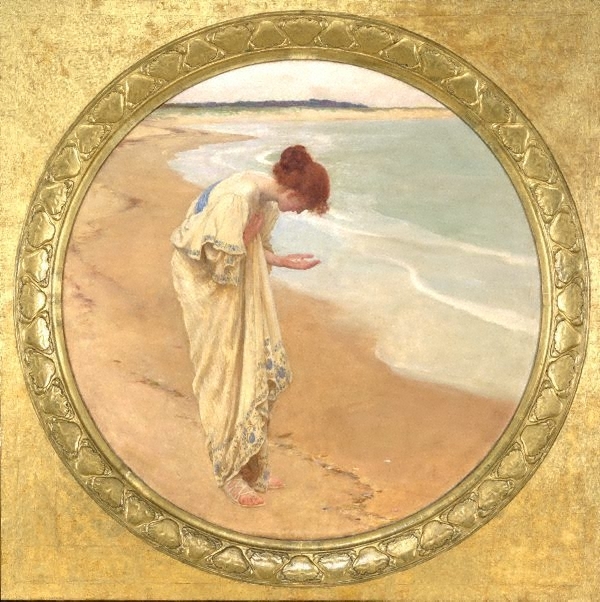 William Henry Margetson, London/England, Purchased by the AGNSW from the artist 1897. Chosen for the Gallery by the Council of the Royal Academy. Bernard Hesling., The Sydney Morning Herald , 'The Sea Hath Pearls, Etc. ', Sydney, 13 Sep 1952. Bruce James, Art Gallery of New South Wales handbook , 'Western Collection: Paintings and Sculpture', pg. 17-77, Sydney, 1999, 51 (colour illus.). J.G. De Libra., Australasian art review , 'The Sydney Art Gallery's late purchases', Sydney, 01 Apr 1899, 16. Australian Women's Weekly , Sydney, 07 Jul 1954. The Sydney Morning Herald , 'Unfashionalble art', Sydney, 28 Sep 1952. Response to Bernard Hesling article. Australia's yesterdays , 1974-1978, 132. The Sydney Morning Herald , 23 Mar 1898, 3. Athenaeum , London, 12 Jun 1897. The Art Journal , London, 1897, 180. Royal Academy pictures, 1897 , 1897, 85. Academy Notes , Unknown, 1897. Art Gallery of New South Wales catalogue of British paintings , Sydney, 1987, 123 (illus. ).